This is the series obligatory 9/11 episode. I'm not an American. That may account for my boredom with this episode. It was visible, even for a European that everyone was really trying to make a profound and deep episode co worthy commemorate (the impact of) 9/11. But in doing so, unfortunately the episode build upon the feeling that was already resident in the Americans in 2001. For someone who has not lived through 9/11 in the US, this episode, with all the 'deep' emotions, just doesn't work, emotionally, it did not resound. It doesn't work in much the same way that fan-fiction doesn't work for someone who has never seen the TV-series the fan-fiction is based upon: in fan-fiction there's a whole layer of characterization and history, and motivation missing, because everyone is supposed to know the lead characters already. 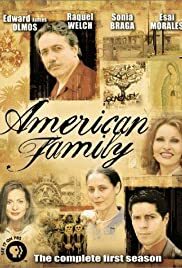 In this episode of American family there is a very indispensable layer of drama creation missing. It was understood that everyone knew it and felt the pain and the desolation and the fear of 9/11 already. That they would remember it when it was hinted at. That however, makes for bad drama, and a boring episode that at time was preachy, and overly explicit in it's patriotism. There was not enough to draw the uninitiated viewer in. It was certainly not up to the normal standard, the beautiful quality, of the other episodes of this great series.